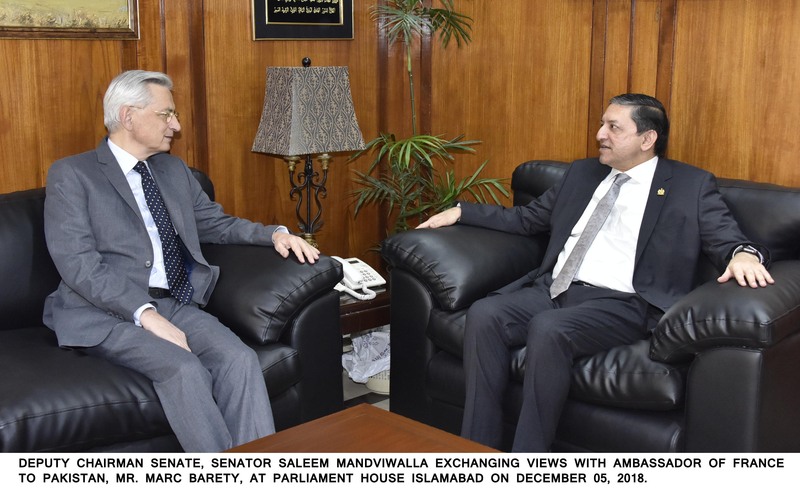 French Ambassador Marc Barety in a meeting with Acting Chairman Senate Senator Saleem Mandviwala at the Parliament House on Wednesday said that French investostors are willing to invest and explore possibilities for investment in different sectors. The Acting Chairman Senate welcomed the remarks of French Envoy and said that trade needs to be diversified as the current volume of trade is much below the mark. Saleem Mandviwala said that trade provides better opportunities to bring people of the two sides closer. “ Business chambers and associations have a huge potential to boost trade” Acting Chairman Senate remarked. He said that business and trade chambers are the power houses generating business activities and consolidating bilateral ties. He said that Pakistan values its bilateral relations with France and desires to further expand these ties through enhanced interactions at parliamentary and other levels. The French ambassador expressed his satisfaction over the security situation in Pakistan. He said that situation of security in Pakistan has improved a lot. The Acting Chairman Senate also raised the issue of travel advisory. He said that travel advisory needs to be reviewed so that people to people contacts and bilateral trade and investment opportunities could be explored. The ambassador informed that trend is positive. “ I have a very positive view of Pakistan as far as security is concerned” French envoy said. He said that France has reviewed it travel advisory for Pakistan. Acting Chairman Senate said that trade volume between Pakistan France needs to be increased and trade chambers can play active role in this regard. He said that Trade associations need to be connected to their respective counter parts to explore the possibilities for bilateral trade and investment. Regarding parliamentary cooperation, the Acting Chairman Senate said that parliamentary cooperation between the parliaments is another area through people to people contacts could be boosted. He also underscored the need for making the friendship groups of the two sides more active and vibrant. Senator Sana Jamali , a member of the Pakistan – France Friendship group, also emphasized the need for increased linkages. She proposed for establishing French Language centres in Balochistan to enable the youth of Balochistan to learn French language. Acting Chairman Senate also extended invitation to his counterparts in French Senate to visit Pakistan and interact to learn from each other’s experiences and exchange ideas for strengthening bilateral cooperation.